Drove up to the Salem NH Winter/Spring Farmers Market this morning. It was the last market of the season, so I really wanted to check it out. There was a good selection of products, but probably not as much as previous weeks. There was even raw dairy products: cheese, milk, cream, buttermilk, kiefer, yogurt, cottage cheese, etc. from Brookford Farm. I was tempted, but I didn’t partake. Isn’t it funny how we become so brainwashed by the govt to be scared of certain food products. Maybe this summer, I’ll get brave enough to try raw milk! From Arrowhead Farm, I bought some awesome tender young swiss chard and mizuna greens (each batch was $3.75). The chard was excellent in my salad for lunch today! They had a very diversified selection of greens, including tatsoi, mustard, and lettuces. They even sell mushrooms! I also purchased a dozen eggs from Hurd Farm for $5. I’m really looking forward to summer! Life is good! And this is an example of why I don’t trust “little” food companies owned by “BIG” food companies! I just received an email from Brown Cow (lately they’ve been promoting the heck out of their new Greek yogurts) and was surprised that their new marketing scheme is bribing their customers to write good reviews for them! We’re so excited about our new Cream Top Greek yogurt, we want to share it with the world – and we need your help. First, we’ll be hosting free sampling events at virtually every Whole Foods Market in the country beginning this Saturday, August 18th, as well as most California Safeways. And we’ll keep them going later this fall at other natural foods stores – so keep your eyes peeled. Second, we created a place for you to share your thoughts about our new Cream Top Greek with the world- and when you do, we’ll send you a coupon for a free cup. Get your free cup at www.browncowlove.com. Write a quick review, share it, and get a coupon for an absolutely free cup (limit: first 2,500 people to enter). You can also enter to win free Brown Cow yogurt for a year – not a bad deal! I’m curious as to what happens when the 2500 coupons are gone; will they inform the customer BEFORE they write their review, or will they break the news that they’re getting the shaft, after the review has been sent? I took a quick look at the process, and first, you must “like” their Facebook page, then you write your review, send it with an option to also share it on your personal Facebook wall for bonus entry (which didn’t matter, because even when I declined to share, it still posted to my wall, sneaky! sneaky!) and finally you need to give them your email, name, address for the coupon, etc. Blah! I didn’t get that far! I know, I know, it’s common practice for social media to play a huge part in business today, and I’m not complaining about using Facebook for marketing means. I personally find it appalling that they’ve resorted to begging for POSITIVE reviews with a promise of a coupon for a free cup of their new yogurt. It is unethical and a screams of desperation, but we, as consumers, are allowing it to happen! Seriously, people will do anything for a free product. They don’t care if the company they’re supporting lacks marketing principles, just “give me a free yogurt please!” Ugh! When will consumers learn that saving a couple of dollars isn’t worth the decline of our country’s business morals. Stand up and refuse to support companies like this! Brown Cow could have easily given out 2500 free coupons in exchange for “liking” their Facebook page. People create a natural “buzz” about a product, sharing links to free stuff like this on their own FB walls. Why force customers to leave a pitiful “review” about a product? If the product is good, people will talk about it instinctively. As far as I’m concerned, Brown Cow Yogurt has lost me as a customer. It’s a shame, because I really liked their cream-top yogurts, but for now, I’m will not support them. Thanks for voicing your thoughts. We welcome feedback here at Brown Cow (yes, even including criticism, as much as it can hurt sometimes!) because it helps us do our jobs better — that is, to make the best yogurt we can and get it to as many people as we can. We really love this new Cream Top Greek Yogurt and we’ve been getting great response from yogurt-lovers everywhere so we wanted to give fans a space to share their passionate feedback. We welcome any review, however — not just positive reviews — so long as they aren’t obscene. On the site, we also encourage users to include in their review the fact that they are getting a free cup, in the name of full transparency. And to answer your question — within a day or so of giving out the last coupons, we’ll switch-up the site so it makes it clear the coupons are gone but you can still leave a review to be entered into the grand prize – which is a year’s worth of free yogurt. We’re a mission-driven company, which is why we use American Humane Certified milk from local farms, why we make our yogurt in small, less processed batches, and why we use only natural ingredients like pure maple syrup and wildflower honey. We do our best to extend these principles to everything we do, and we made a point of doing that here too. We’re sorry to hear that you think we fell short in this case, but hopefully this note helps add a bit of background and context to our thinking here — and we’ll certainly take your feedback into account as we plan for our promotional efforts in the future. Hmm, that’s skirting around the issue a little bit, huh? Just a lot of Big Food marketing babble. My point, which I don’t think they “got”, was that they were basically paying for reviews. They’re trying to make it sound like their customers needed a “forum” for their passionate feedback….and THAT’S why they started the promotion. Uh, do they really think they would have got all those “passionate” reviews if they weren’t offering a free cup of yogurt in exchange? And regarding the review form – “within a day or so of giving out the last coupons” they’ll make it known that the coupons are exhausted. So, for that “day or so” people are still leaving reviews thinking they are still getting their free sample. Do they think that those few hundred people are going to settle quietly and not cause a huge fuss over being too late? No way. As for their American Humane Certified claim, I have to do more research, but since Eggland’s Best eggs are certified as well, I’m not sure how much credence I put into this organization. I’ve been learning about making my own yogurt at home, & I think it’s definitely time to try! I found the Connecticut Farmer & Feast: Harvesting Local Bounty book at the library, and took a few weeks to read it. The book opens with an introduction and I was saddened & shocked to learn that Connecticut’s farmland is disappearing at an unbelievable and alarming rate of 8000 acres a year! The author, Emily Brooks, states that it is one of the fastest in the country! In less than 20 years, CT has lost 21% of their farmland; residential and commercial building is taking over. She also states that farms require less than 50 cents in town services for every dollar they generate in local taxes while residential development costs towns more than 1 dollar for every dollar of revenue generated. That statement puzzled and intrigued me, so I did some research. With the cost of schools/education, police/fire, road maintenance, towns that have a choice to purchase & save open space vs allow commercial/residential development, are much better off in the long run choosing to save the open space. Real estate taxes go up for everyone to recoup the cost of more children attending schools. When I think about it though, we can’t blame the farmers for selling out to developers. The local farmer is overworked and vastly under-appreciated. That’s why this book is so important. It shines the well-deserved light onto local Connecticut farmers. The book is divided by county. Each farm is highlighted with a few pages, including their location info and a full description/interview with several photos. There are many different types of farms including many that grow vegetables, several that raise animals, and some even operate a fishing/shellfish business. I was amazed that there were also a few maple syrup producers, although the book states that only tenth of % of all maple trees in Connecticut are actually tapped for their syrup. This is not necessarily a cookbook although there are lovely recipes using some ingredients that the highlighted farm sells. It’s more like a history book with stories from each farm with photos so you can really see each farmer and the land they work. Some stories are heart warming and some are heart breaking. For instance, the owners of Futtner’s Family Farm (3 generations) are going through financial problems due to health issues. They are drowning in medical bills. Theirs is a sad but hopeful story of family and deep love for each other and farming. I wish we lived just a little closer to Connecticut and some of these marvelous farms. It’s exciting that the author is currently writing a ” target=”_blank”>similar book for NYC. I really hope she considers a Massachusetts version in the future! It’s something that could be a fantastic reference for every state! If you live nearby to Connecticut, I recommend finding a copy of the Connecticut Farmer & Feast: Harvesting Local Bounty book, even if it’s from the local library. It’s a great resource to learn more about specifically where your food comes from! I love reading cookbooks, like some people love reading novels! I am inspired by recipes, and enjoy learning ideas from cookbooks, which means I’d rather put my own spin on a recipe than follow it exactly. Please keep in mind that my opinions might be completely different from the other home cooks. I found an inspiring recipe over on Kalyn’s Kitchen for ; I had some yummy swiss chard greens from this week’s CSA share, and I knew it would be a great substitution for the kale. 8 oz fresh ricotta cheese – I used whole milk ricotta, but to save calories, part skim might be preferred. 1 – 2 oz grated cheese – cheddar, Parmesan, Pecorino, whatever you have on hand. 2-4 servings depending on how hungry you are! We turned what was originally thought to be four into just two servings for us. Wash swiss chard leaves, pull/cut off ribs, then coarsely chop and quickly steam in a shallow saucepan or fry pan. About 1-3 minutes. Use a little coconut or olive oil to grease the bottom and sides of a baking dish. 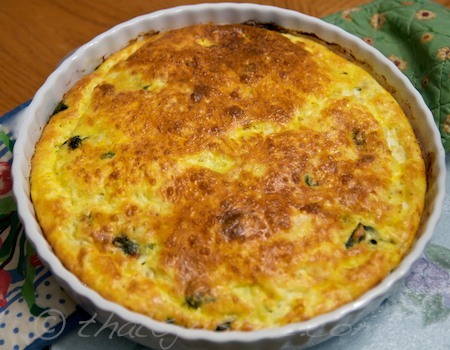 I used a large round quiche pan. Kalyn’s original recipe suggested to use a spring form pan. Any type of glass or ceramic baking dish would be fine. Line bottom of baking dish with steamed swiss chard or greens. In a medium bowl, combine ricotta, grated cheese, and salt/pepper. In separate bowl, beat eggs, then blend into the cheese mixture. It’s lumpy, so don’t be alarmed. 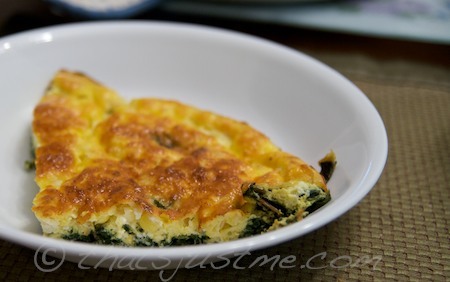 Pour egg/cheese mixture over swiss chard greens in baking dish. Bake for about 20-40 minutes, maybe longer depending on the depth of your pie. The original recipe called for 40 minutes, but her pie was much thicker. Allow to cool and enjoy! Serve with a small salad or even veggie soup. Great for Meatless Mondays! Farm fresh ricotta is always the best choice before a grocery brand. It tastes like cream! I like Maplebrook Farms from Vermont…they also make fresh mozzarella cheese. We also received 2 very small corn on the cob in the CSA share this week. I figured instead of boiling them, I’d add some freshly cut corn off the cob. Well, because there was such a small amount, the corn really didn’t add anything special to the dish, so I left it out of my recipe here. I would have loved to add a sprinkling of freshly grated nutmeg into the cheese mixture, but since my microplane grater/zester had soft cheese all over it, I couldn’t grate the nutmeg. Next time, I’ll grate the nutmeg first. Leeks and tomatoes would also make a great addition! Hmm, like sliced tomatoes placed on top before baking! Yum. Much hoopla was made about Oprah and her staff challenging themselves to live vegan for a week. I just watched the show on my DVR and here are some of my thoughts. The show opens with a video of last week’s Harpo staff meeting and the challenge to go vegan for a week – that means no meat, eggs, & dairy. Immediately all you see is Kashi logos! Kashi is everywhere, on the bags they’re handing out to staff members, later in her office, Oprah even mentions how much she loves Kashi products. Yuck. Doesn’t anyone realize that Kashi is Kelloggs crap in disguise? sigh. It’s highly processed, sugarly, full of soy! STOP with the Kashi! I loved seeing Michael Pollan. I adore him. He has so many good ideas, and his books “In Defense of Food: An Eater’s Manifesto” and “Food Rules: An Eater’s Manual” truly changed my life! So, he advises that it’s okay to eat meat, just don’t eat a lot of it! That is how I am slowly trying to live. (Baby steps, baby steps!) Be a conscience eater! Be aware about where your food is coming from! Michael states that the American diet is now a catastrophe. 75% of our healthcare spending is on chronic diseases linked to diet and it’s bankrupting us. Too many calories, too much processed food, tons of refined carbs (sugar, white flour). Next, was a video segment on how beef is produced. The video starts at Timmerman Feedlot in La Salle, Colorado, where cows eat corn and corn by-products for 200 days until they are fat enough for slaughter. They gain about 3 pounds per day. The video shows the following day at Cargill Meat Solutions in Fort Morgan, Colorado, the largest producer of ground beef in the world. Cargill was portrayed as a “kind” beef slaughter house (that sounds like an oxymoron) and I immediately recognized the handling system, designed by Temple Grandin to keep the animals calm. I suppose if you have to die, the way they do it seemed to be fairly respectful. They filmed the process except when the animals were struck with the 4 inch metal bolt and killed. They showed skinning, sawing, and other assorted beef processing. Unfortunately (as pointed out on the show) a lot of the slaughter houses are not as kind or clean, especially when it comes to poultry. It’s too bad that Oprah didn’t show a poultry plant, but I imagine not many of them were too eager to be filmed. I would be a hypocrite if I said I never bought feed-lot beef, but it really doesn’t seem like a healthy, happy way for a cow to live for 200 days, stuck in a lot, eating corn. Thankfully, Whole Foods always has freshly ground 100% grass fed beef, so I never have to purchase beef ground in a factory. Oprah’s next guest was Kathy Freston, the “Veganist”, her book “Veganist: Lose Weight, Get Healthy, Change the World” was just released. Kathy led the week long Vegan challenge, and offered a lot of advice to the staff. I love the new buzz word “veganish” – that’s a lifestyle that perhaps I can someday see myself living. From the Urban Dictionary: Veganish: An eating practice for people who kinda want to be vegan, but sometimes just need to eat some cheese or chicken. Michael Pollan voiced a concern about going “all the way vegan”, as opposed to someone that eats meat occasionally: first “these great farmers we have in this country who are doing really good work” going on to say we need to reform the meat system not eliminate it. He also worries that getting off meat entirely that you “end up on a lot of processed foods” and he praised Kathy’s book for warning about this danger. Sounds promising, you don’t need all that processed “meat and cheese alternative” junk! I like what I’m hearing! …until a later segment where Kathy’s shown going grocery shopping with Jill, an Oprah producer. What do you think she’s suggesting to them? Processed meat/dairy alternatives! Filtered water, tapioca and/or arrowroot flours, non-GMO expeller pressed canola and /or non-GMO expeller pressed safflower oil, coconut oil, pea protein, salt, vegan natural flavours, inactive yeast, vegetable glycerin, xanthan gum, citric acid (for flavor). Still processed, but not too bad; I might actually try this food. I like that they clearly state that there’s no GMO canola or safflower. And they are soy free! And yes, this cheese substitute can be easily frozen! On the negative side, yeah, there are some ingredients that my grandmother wouldn’t recognize as food (Food Rule #2) and there is no calcium, like normal cheese. Next recommendations are meat substitutes. Did you notice the camera paused effectively on the Kellogg’s Boca Burger package? hmm. Oprah producer, Jill chooses a box of Hickory Smoked Tofurky Deli Slices. Okay, so it’s made from organic tofu and there’s no GM oils, but nutritionally, what is the difference between that and a package of Hormel turkey slices? Wouldn’t it be better to just tell people to eat a (natural) nut butter and (lower sugar) jelly sandwich, and get off the deli meat all together!? So, Kathy Freston then recommends Gardein products. Although this product line is not as horrible as the Boca burgers (Kraft) and Morningstar Farms (Kelloggs), it’s still a highly processed food. water, soy protein, vital wheat gluten, ancient grains (quinoa, amaranth, millet and kamut®), natural flavors (from plant sources), potato starch, expeller pressed canola oil and/or safflower oil, pea protein, modified vegetable gum, carrot fiber, organic beet root fiber, organic evaporated cane juice, yeast extract, vinegar, sea salt. rub: spices, red bell pepper flakes. First, there’s a good chunk of processed soy and processed wheat (TVP) which is probably genetically modified, along with canola/safflower oils and sugar from cane juice. Why do we need sugar in chicken? Hmm, could it be the product tastes so bad, it needs a boost of sugar (and salt) to make it taste better. “Ancient grains” are on their list of ingredients, but the pessimist in me thinks these buzz word grains are added just so the product looks healthy and “modern”. And sorry, their beef alternative products really look scary! Non-dairy milk is next. Kathy grabs a carton of Almond Breeze chocolate milk. Okay I have used unsweetened Almond Breeze milk before, but why is she recommending the chocolate flavor? Yeah, of course it tastes great because it’s loaded with sugar!!! Duh! I wish she verbally suggested the SoDelicious unsweetened coconut milk, but at least the camera focused on their products. Of course veganaise and earth balance are next on her shopping list. I might actually buy the grapeseed veganaise product, because it’s soy and canola free – update: I took a look at the ingredients at the store, and it DOES have soy, so nope, I won’t be purchasing this. I previously considered buying the soy-free Earth Balance, but it still includes canola oil, so I just choose organic whipped butter instead. Simple, fresh, and less fat/calories. The show was supposed to be about being conscience of where your food comes from. Do you know where soy protein and canola oil comes from? Most of us might know how a pea comes to our table, it’s grown in a farm, but how is pea protein created and what impact does the process have on our environment and health? My guess is they couldn’t really tell the truth because the episode was heavily sponsored by Kelloggs (ending titles credited Kashi with partially funded the show’s production)! So, they left out important details about these processed vegan-friendly foods. Unfortunately, a lot of Oprah groupies will buy anything that she and her guests’ recommend. I can hear roar at the grocery store, followers stocking up on any and all meat/dairy alternative products without even a glance to the list of ingredients and/or nutritional data. They’ll be replacing their normal processed foods with other processed foods and think they’re making a healthier choice! All in all, it was a decent show, and it was great to hear the experiences of some of the staff members. But I wish they didn’t put so much emphasis on the processed alternative foods, after all the show was supposed to be about being conscience about where your food comes from. I wanted to see more discussion on whole grains, beans, nuts, fruit and vegetables! Local Day at Whole Foods – 2nd Visit! Another great shopping experience at the Bedford, MA Whole Foods. It was LOCAL DAY again! Just like last time, I met some great people. I was hoping to see a couple of the locals I met last time, like Nancy from Three Acre Kitchen, the woman from Ozioli’s Cookies, and WS Badger Company. Today, I did purchase a tin of the original Badger Balm today. I kept searching for it at other Whole Foods stores, but couldn’t find it. I love that light wintergreen scent! I’ve been using the balm on my hands tonight and I love it. The balm is very thick; it was difficult to get a good portion out of the tin because it’s so compressed. I finally figured out that instead of trying to rub it on my hands, I should rub my knuckles inside the tin, and that worked better! Anyway, I love that it’s totally natural, and can even be used on your lips! I need a natural moisturizer while I’m cooking, and this will work wonderfully! Grillo’s PIckles was set up by the entrance (produce section). I sampled each of their freshly made Italian dill pickles. There was the original recipe, which was delicious, and the spicy hot recipe, which I was told gets hotter the longer the container is open in your fridge! Ha! I preferred the original – ooh I love pickles! I didn’t purchase today, but definitely will in the future, probably in the spring, summer, when we start cooking on the BBQ. It’s so cool finding local Massachusetts food companies! Then I met a rep from Schlotterbeck & Foss, who had a selection of sauces. She was cooking up samples using the sauces as marinades. I really wasn’t too happy with most of the flavors, since they were pretty high in refined sugars. But I was thrilled to find their Country Ketchup. $4 for a 12 oz bottle, not a bargain, but she gave me a sample, and oooh it was yummy. It didn’t taste like normal boring ketchup; it was loaded with yummy chunks of peppers and onions, and there was a spicy kick! It would be great with BBQ’d burgers. Sugar was 4g which is the same as most ketchup. I bought a 3 oz bar of 80% Stone Ground Organic Chocolate from Taza Chocolate. My husband was a little shocked that I paid $7 for such a small bar, but I plan on using it for something special, maybe melting the chocolate and pouring it over some crisp organic bacon! Anyway, Tazo Chocolate is from the Boston area, and use organic fair trade cacao. They also offer tours of their factory! It’s also cool that (on their web site) you can type in the batch code on the back of the chocolate bar, and find the details of the chocolate and how it was made. Anyway, I ate samples of their 50-60% chocolate discs (Vanilla Bean Mexican, Salted Almond) and they were delicious but a bit too sweet for my taste; the rep told me they are planning on creating more darker flavors very soon. I have previously purchased the 1 year Whole Foods Team Member crafted cheddar from Grafton Village Cheese. I love cheddar cheese, the sharper the better! So, it was great to see a Grafton Village rep at the store today. She had samples of the 1 year Team Member cheese, along with the 2 year aged. I bought a small chunk of 2 year. 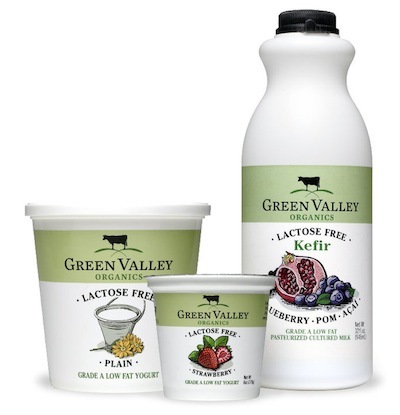 And now that I know that they use dairy from Vermont “Jersey” cows that graze on grass for most of the year (except colder winter months), I will look for their brand a lot more! I sipped a sample of the antho-immune organic elderberry syrup from Maine Medicinals. It tasted alright, but it’s really not something that I’d buy. I also sipped a sample of chai tea, and I wish I took note of the company name. Chai isn’t really my thing, so I didn’t purchase. I had a sample of skim milk from High Lawn Farm from Lee, Massachusetts and while I am not a milk drinker, I will definitely keep them in mind, because I do occasionally purchase smaller quantities of milk, cream, half & half, egg nog, etc. The farm offers dairy products from Jersey cows, and she was very proud to tell me that Jersey cows’ milk is 20% higher in calcium than other cow’s milk. It’s also richer, so skim milk is more like whole milk…and their whole milk is more like cream. I have to admit, the skim milk I tried didn’t really taste rich to me, but as I said, I’m really not a milk fan! But anyway, I love that they are raising high quality Jersey cows, grazing on grass in the summer, and hay and corn that they grow themselves in the winter. No GMO (genetically modified) or pesticide usage, no hormones. They say they milk only twice daily, which is more “humane” than dairy “factories” that milk more often. Happy cows! Their web site states they also produce butter. I don’t believe I’ve seen their butter products at Whole Foods, so I’ll have to look into that. If I can find a local good quality butter source, that’ll make me very happy! A rep from SoCo Creamery was there again. I didn’t purchase any ice cream this time though, but I did have a taste of their ginger flavor and Mexican something or other. Both flavors were really good, but strong; good for a spoon or two, but I don’t know that I’d want to eat a whole bowl of it. But I won’t hesitate to buy their brand in the future when I’m shopping for good quality ice cream. Lastly, I met the owner of a brand new company called Five Acre Farm. He makes jars of fruit topping/pie filling. I tasted the cherry and immediately thought about my husband, as he’s a maraschino cherry junkie, but I love blueberries, so I decided on that flavor. The owner spoke of high quality ingredients like Maine blueberries, and he even was using organic cane sugar (not beet sugar). I plan on adding the blueberries to plain yogurt. There’s 17g of sugar in a 1/3 cup, so that calculates to about 3 grams for 1 Tbsp. I paid $6 for a large 25 oz jar of fruit. So, that was my day! I enjoyed speaking to so many different local businesses, and it’s nice to try a sample of a product before buying it. It looks like the Bedford Whole Foods regularly offers a “Local” day and I think Woburn also does as well. I love shopping at Whole Foods, but this gives it an extra special reason to shop on those particular days! Author debbie @ That's Just MePosted on January 7, 2011 November 25, 2011 Categories Food, ReviewsTags 52 Foods in 52, Badger Balm, dairy, FOOD, Grafton Village Cheese, Grillo's Pickles, High Lawn Farm, local food, Ozioli's Cookies, Reviews, Schlotterbeck & Foss, SoCo Creamery, Taza Chocolate, Tazo Chocolate, Three Acre Kitchen, whole foods marketLeave a comment on Local Day at Whole Foods – 2nd Visit! I’ve been buying Green Valley Organic Yogurt for a couple of weeks now, and I just love it. First, most importantly, it’s delicious! I’ve tried the blueberry, strawberry, and honey. Honey is okay, but the fruit flavors are very good. I really need to buy some vanilla and create my own flavors with frozen berries, bananas, apples, pineapples, etc. It would be so much better for me too! I love that it’s organic and their dairy comes from farms that are certified humane. Not that that “label” really means anything, but at least it’s a start. No anti-biotic or growth hormone usage, and I like to think their cows aren’t hooked up to milking machines all day long. I’m interested in trying their Kefir as well. I used to love love love the bottles of Stonyfield yogurt smoothies, but they were so extremely high in sugar, I gave them up! Green Valley offers plain plus a Blueberry Pom Açaí flavor that has 20 grams of sugar. Looks like each bottle is 32 oz, so that’s 4 servings of 8 oz each. The yogurts are 6 oz servings at 16g of sugar, so it breaks down to roughly the same amount of sugar per ounce. It doesn’t look like it’s available in any other stores in my area, except Whole Foods, but that is a good thing. The more “mainstream” a small company becomes, the more they change. Less care goes into the product. I like that they are a small business. I hope they don’t get bought out by one of the big food companies like Stonyfield did. Anyway, Green Valley Organic yogurt is definitely my yogurt of choice! I hope they don’t mind that I used one of their product photos for my post! The new Domino’s commercial just infuriates me! They’re trying to jump on the grass fed bandwagon! Their new commercial is trying to give the impression that their cheese comes from happy grazing dairy cows in a pasture! The commercial shows a “panel study” group discussing how they don’t trust the ingredients that Domino’s uses, and then all of a sudden, the walls come down and they are smack dab in the middle of a cow pasture, surrounded by cows. Yeah right! That’s realistic! While I admire Domino’s Pizza marketing department for trying to revamp their image, starting from scratch, putting together a new pizza recipe… I hate when big food companies try to pull the wool over consumer’s eyes. Just like the ads for “happy California cows“, it’s very misleading! The majority of dairy cows do not lead a wonderful carefree life, as depicted in the new Domino’s Pizza commercial. I would be a hypocrite if I said that I didn’t eat dairy; in fact, I adore cheese, but I try to limit my consumption just because it really is a cruel life for a dairy cow. And Domino’s Pizza is just adding to the misconception! I don’t think I’ll be trying Domino’s new improved pizza any time soon! Yes, the farm in the commercial is a real farm….googled and found some info. Truttmann Dairy, LLC is a real farm, and they look like they are doing the right thing by raising their cows naturally and grass based. BUT it’s highly unlikely that this farm provides the bulk of Domino’s cheese inventory. My guess is, Domino’s is using a much much larger diary or dairies and Truttman’s is actually just for show to make consumers think they are getting a natural product. There aren’t many farms left that are like Truttman’s and I applaud them for trying to do the right thing. But there is no possible way that Domino’s is using grass based naturally raised dairy on all their pizzas! So, quit fibbing to the public, Domino’s and fess up! Word is the next commercials will cover their naturally grown tomatoes and spinach! Can’t wait to see them! While we were away on vacation, we visited the Yarmouth Clam Festival and Cabot had a little booth set up, with samples of horseradish, extra sharp and pepper jack cheeses. I LOVED the horseradish and pepper jack. Yum. I was hesitant to buy it before, so getting to taste it was great! So, I was at Market Basket, grocery store this week, and I saw the horseradish cheese in the dairy case. I turned the package over to read the ingredients, and oh no! “Natural and artificial horseradish flavor” – artificial flavor? yuck! It also had the additive sodium citrate! So, I put it back down and decided to check Whole Foods for a more natural brand of horseradish cheese. I’ll still buy Cabot sharp cheeses, but I’ll stay away from any of their flavored cheeses. Too bad they couldn’t stick to a more natural list of ingredients. Ha! They can’t even call this product “milk” – it’s a “dairy beverage” – that should tell you right there that there’s a problem. Sort of like American Cheese is not really a cheese, but a “cheese product”. So, I hadn’t even heard of this product, but I just read a post on a forum about it, so of course I had to google.